Posted December 3, 2013 by Alicia McClintic. I’m so excited for my neighborhood to be decked out in its full Christmas garb, and looking for the new additions to the scene is a kind of nightly ritual for me right now. Coming home from work I drive through my neighborhood extra slowly, craning my neck to see which house on my block is newly decorated, lit up, and festive tonight. And every night I notice a new house has put up Christmas lights, or another family has bought a Christmas tree, or somebody has a fire going in their fireplace. Days are shorter, darker, colder this time of year, but right now, I don’t mind because I get to see these bits of light peeking through the darkness. December 1 marked the beginning of the season of Advent, the part of our life as a church where we engage in expectant waiting, joyful anticipation, and reflective preparation for celebrating the coming of Jesus at Christmas. 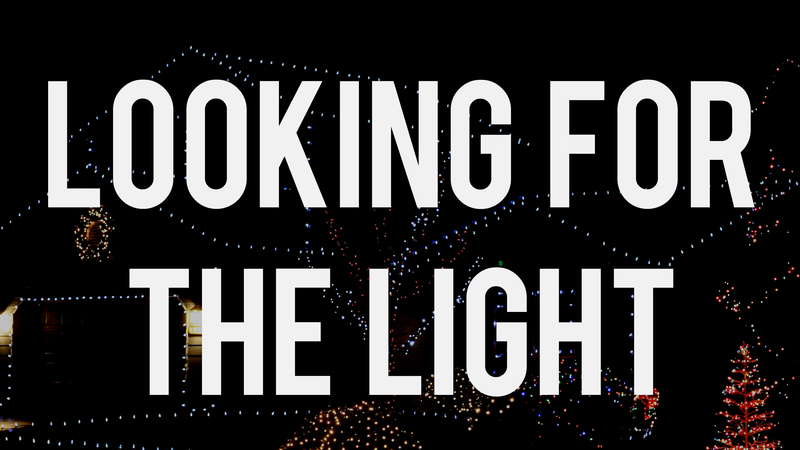 In the same way that I look for glimpses of Christmas lights in my neighborhood, during Advent we look for glimpses of Jesus, the Light of the World, breaking into our current reality. During Advent, we remember that the extraordinary interrupts the ordinary, the holy displaces the daily, the Light of the World breaks through our Darkness—and we look for it expectantly. But as we look expectantly for this inbreaking, I’m reminded expectations are tricky things. Sometimes we expect too little or nothing at all. It’s my second Christmas in this neighborhood, so I remember all this stuff from last year, and sometimes there’s a little temptation to say, “No big deal, nothing special, I’ve seen this all before.” And yet, the big invitation is to find newness and freshness—not only in the same old Christmas decorations I’m seeing put up, but also in the same old Christmas stories and themes I’m hearing (and have heard all my life). In our apartment, we’re putting up basically the same decorations this year as we did last year, but at the same time it feels a little different. The same old things serve as a kind of benchmark to show how we in fact have changed. We were different last year and so this iteration won’t be exactly the same because we are not the same. Similarly, the same old Christmas stories and themes remind me that God and God’s promises are still the same, but they also invite me to look again with fresh eyes for a fresh movement of God in my life and community, to look for fresh possibilities for redemption and wholeness. Advent is a time to remember the way God broke into our world by being born as a baby, and it’s a time to expect God to break in again in new ways. What if during this season of Advent I looked expectantly to the people in my life for signs of God’s movement the way I look expectantly to the houses in my neighborhood for signs of Christmas decorations? What if I started asking about what God was doing in his life, or how God was moving afresh in her story, or how we as a church are bringing the light of God to our city? What if we started looking into the lives of our community for stories of God’s radical, life-changing presence surprisingly breaking through mundane routines? That’s what Advent is about. We engage in a simple practice: We watch. We pay attention, for we do not know when or how God is coming into our lives. But we do know this: God is coming. The scriptures teach us that Christ is coming into the world, and on the first Sunday of Advent, this is our hope. Watch for it, Jesus says. And in the meantime, remember the simple and yet deeply profound word of hope: God is faithful.